I invite you to live vicariously through me. It’s been a long while since my last bag review, so I have to say this is LONG overdue! 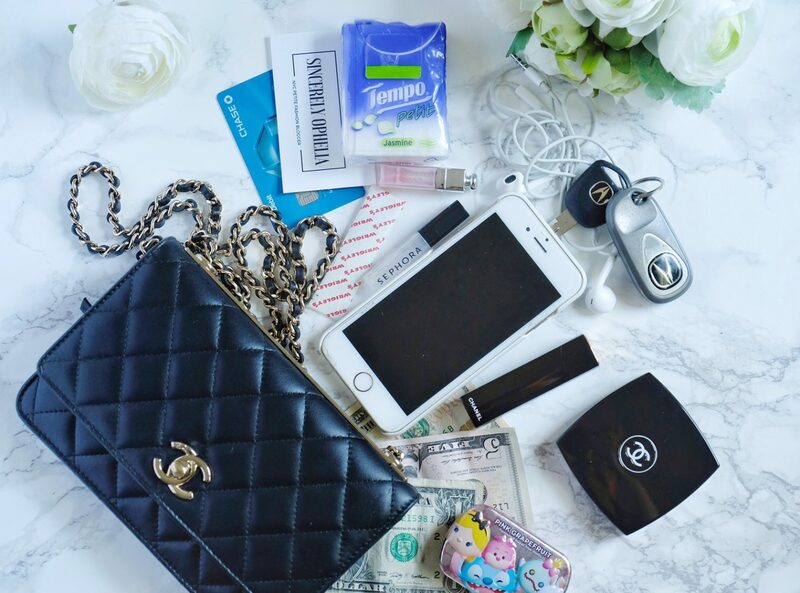 I was going down the list of my purses and decided to review one of the Chanel WOCS (wallet on chain)! And to tell you my personal story with it. With the Chanel WOC, I was searching desperately for the classic caviar with gold hardware one for a while. I was waitlisted in multiple stores in New York and when my mind is into something, I just do a ton of research on an item. And YES – that entails a bunch of youtube videos and blog reading. THANK YOU to my fellow bloggers and youtubers who kept me sane while I was thinking about the Chanel WOC 24/7. Well, during my research I stumbled upon the season’s WOC offering and it was the Trendy CC WOC that caught my eye. I immediately fell in love with it because of it’s interlocking C turnlock and the trendy bar on top. It was a WOC, but had elements of a Chanel Flap! I found it to be the perfect combo. Then, the hunt for it began. I looked for SA’s all over the nation and texted them photos of the style I was looking for and finally located one in New York at Bergdorf Goodman! How lucky was I?! I jumped the gun and purchased it for myself in time for Valentines of 2017. It was definitely a nerve wrecking journey, because a limited amount of these were produced and the one I found was apparently the last one in the US and even Chanel Boutiques didn’t have them. I definitely lucked out. Onto a review of the bag! I’ve owned it for almost a year now, so I can tell you all my personal experience with it. A little background of the bag. The bag was first released for Chanel’s Fall 2016 collection and it’s the first WOC to feature the Trendy CC bar, which was based off of their Trendy CC bag. The first color released was the black and later an abundance of colors followed such as red and yellow. The bag is now a design available in limited quantities and limited colors as with most Chanel designs. So it’s really up to your luck whether you land the color of your dreams. Another thing to note is that this Trendy CC WOC only comes in lambskin and not caviar. Lambskin is always going to need more tender love and care than caviar. Chanel’s more recent lambskin is supposed to be more durable as they’ve added a new way to treat it. However, be reminded lambskin is unique so it depends on the quality of the batch. I would advise inspecting the quality before purchase. Mine was perfectly soft and felt on par in terms of quality. I did get a bad scratch on the back corner of mine when I fell onto concrete last July. But that’s a given since it scratched against concrete. My heart still aches from the incident, but it’s normal wear and tear. The same probably would have happened if it was other softer leathers such as calf skin. Lambskin does not do well in rain, so do not get it wet. I do full protection for my bags, you can review how to in my previous post here. However, I would still not advise in heavy rain. I’ve gotten little water marks on mine when it drizzled and I cared less and just carried it. Granted the marks disappeared after it dried, I would advise against having contact with water. Just don’t use it on a rainy or snow day and you’re good to go. OR if you’re caught in such weather conditions with it – it’s a small bag so protect it by wearing it inside your jacket. Those scenes of ladies getting rained upon but protecting their bags as if their life depended on it, is not a joke, but a reality. This WOC is definitely more roomy than your regular WOC. The interlocking C turn lock gives you a bit more room. The amount of stuff I can fit in it is the same as the amount I can fit in my 2014 small Chanel Boy bag. It’s also about the same amount as a Celine Small Box for reference. 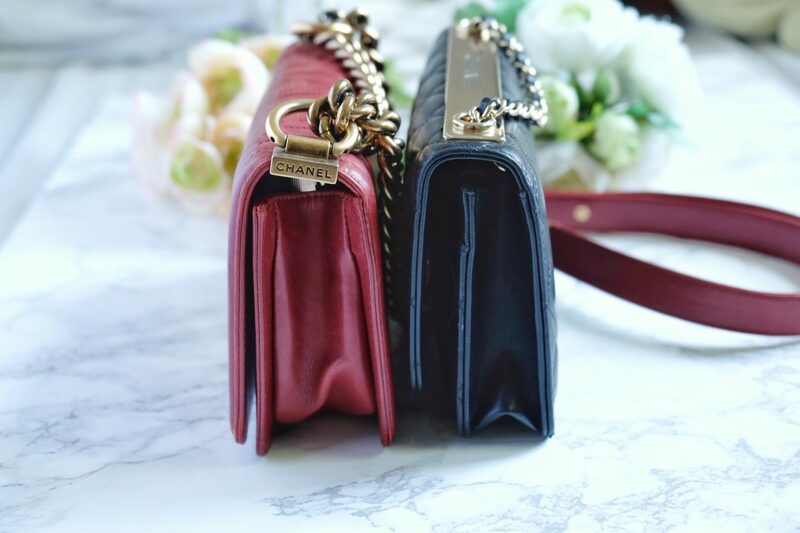 It will also fit approximately the same amount as the Chanel Mini Flap. I think that this bag is super classic and workable with any outfit. This is probably one of my most used bags since I can use it all seasons. It’s easy to style and I’ve gotten so many compliments on it in person and on my instagram! I got my Chanel Trendy CC WOC last year for about $2700 USD after tax. Chanel has increased their pricing yet again this year. An expected increase of roughly 6.5 – 8.2% on their classic designs, but a unexpected increase of a whopping 19% on their WOCS! A Classic Chanel WOC was roughly $2100 and has now spiked to $2500. I could not confirm prices in stores for this Trendy CC WOC due to it’s limited availability. But you can expect an increase of roughly 19%. So it should be roughly $500 more before tax at a range of $3200 USD. I still spot some online at the $2700 price range, so I recommend checking it out at online consignment stores. 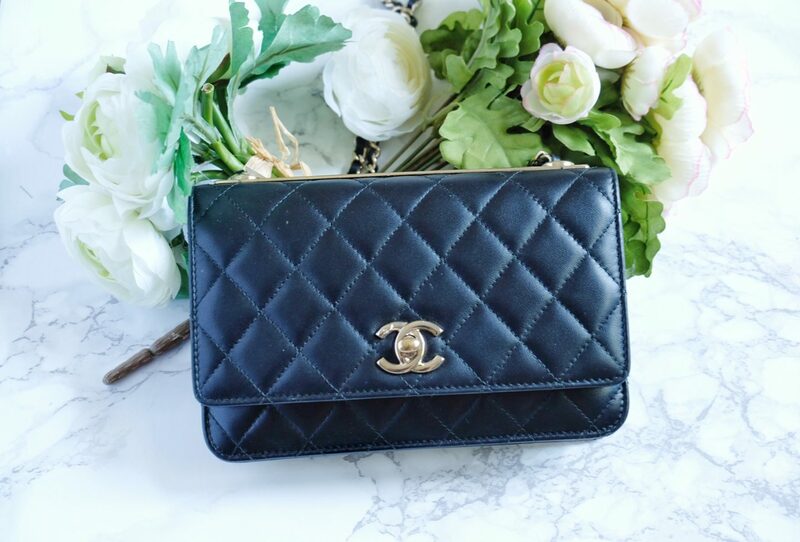 I think that the mix of classic and trendy makes this bag a strong contender against other WOCS on the market or other Chanel bags. I think the price point is decent for it’s intricate design. Chanel bags will always have a steady increase so it’s really an investment you have to make sooner rather than later if you have your eyes set on it. The lambskin is luxurious, but the high maintenance is definitely something to keep in mind. For me, it grew on me and has not been a big problem. This bag is definitely a keeper for me and will serve me for years to come. Next week, I’ll be making price and size comparisons for this Chanel WOC to other Chanel pieces and really put it under the microscope in terms of price and size and telling you if it’s really worth it! So if you’re curious to know more, definitely stay in tune for another segment dedicated to Chanel bags! I hope you enjoyed this post. And have a wonderful rest of the week! Hi! It’s Ophelia! I’m just a fun-size petite Asian girl living life in NYC, with a big heart for the love of life. I'm an overshareer of all sorts and enjoy inspiring others. Through this blog, I hope to share my styling ideas, shopping finds, latest trends, and solutions to everything related to fashion and beauty. For reference, I am 5 feet 2 inches. I typically wear XS/S or 0-4 for apparel and 6.5-7.5 for shoes. Easy Halloween Look! “The Black Kitty” Under $10! Such a cute bag girl! I’ve always wanted a Chanel purse!! I am leaving town soon, now I want one of these before I go! Great review dear… the colored ones are great too… but black is classic! Surely this stylish Chanel bag will look voguish and fashionable with any outfit or attire you wear. It suits you very well! I need a new purse now, this is such a pretty and cute one. I told myself I will stop looking for bags but I guess I’ll break that rule just once and start finding me a cute investment. Omg I am just so obsessed with your Chanel baby!!!! You literally made me want to splurge on another one! This is such a lovely bag, but I can’t imagine spending over $50 on one. I’m just cheap that way. 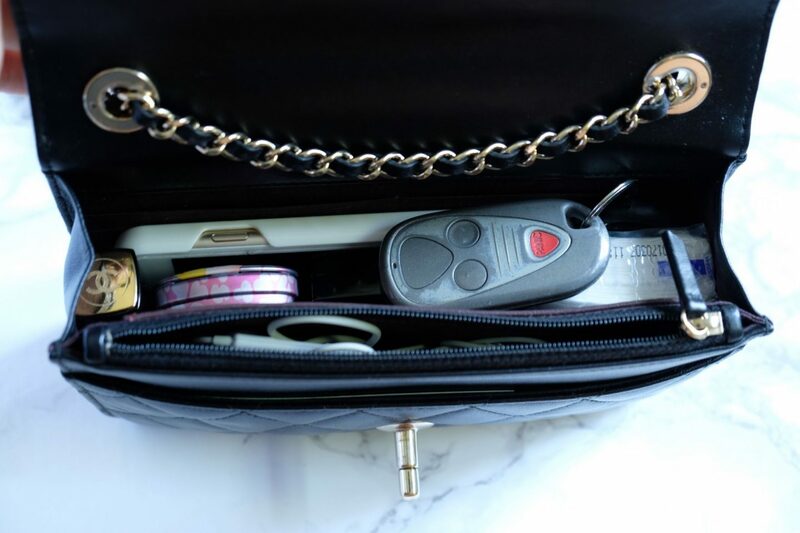 Plus I tend to be rough with my purses–they’re usually pretty messy, filled with pens, receipts, and change. I always thought Chanel had some of the best quality products on the market. This purse is so high fashion! Absolutely adore it! One day I’ll be able to afford a Chanel bag!! I’ll admit, I’m too cheap to spend over $50 for a bag, especially that size. It is lovely though, and ones without a budget could indulge. I love the bag, it’s so cute. I don’t know if I would be able to fit my stuff in it, but I would try. I love Chanel. Investing in quality shoes and bags is totally worth it. WOW!! You definitely lucked out finding this bag. It is soooo perfect and gorgeous. 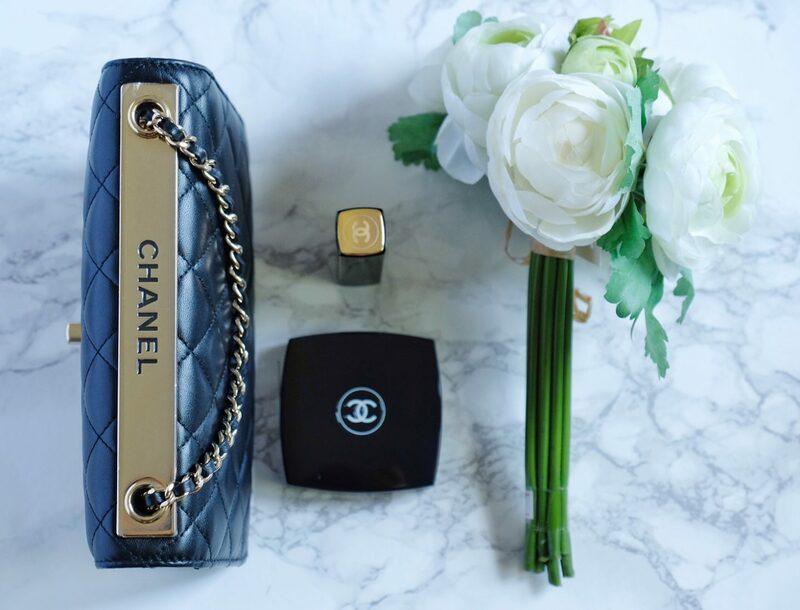 You can never go wrong with a classic Chanel bag! The bag is cute and love the colors too. But I wonder if I would be able to fit all in. Definitely of good use for some occasions. What a gorgeous handbag! If I was to choose a higher end style of handbag I would so go for this one, it is perfect and looks so cute!! I love Chanel handbag! It’s so gorgeous and chic! My gf would love it. This is so stylish. When I started to read your post, I thought I may not fancy it as I love big bags. But I was happy to be corrected. It has SO much space as compared to a regular purse. I hope I can find a similar one. Lovely bag! Love the flats as well. 🙂 Can never go wrong with Chanel. This bag is STUNNING! Maybe I can talk my husband into one for Valentines Day 😉😉😉. I usually only collect vintage but this might be a must have piece! Chanel is always such a high quality designer item. I just wish it wasn’t so expensive! I love that Chanel is such a versatile brand! That handbag can go with so many outfits. Very BEAUTIFUL!! Wow! The price caught me off guard. Great job on the pictures and review. Do you have a deal with the company? Thank you! And No. this is a non-sponsored post for ladies who are curious about the bag. I paid for it with my own money at full price. Haha 🙂 hope that answers your question. Nice bag! Your pics look nice, and yes, it DOES look good with any outfit! If I could afford the bag, I would not want to take it with me anywhere, to be honest, because of the fear of losing it. This purse looks so cute and gorgeous. Love the black leather too! This definitely goes will any outfits! This bag is so stylish and chic!! The purse looks so nice. e for meWould love to have one of that but i guess its too expensive for me to buy. Wow! It goes perfectly with those shoes! I love this bag. Nice bag. The $2700 does seem a bit much, but hey, it’s a luxury bag. I bet it will last you a long time. What a nice read. This is quite educational. Thanks for sharing dear! I was impressed how spacious the inside is. It looks small from the outside but it carries a lot of things! Will definitely check this out. Thanks for sharing! That is a cute purse but wow it costs as much as a brand new MacBook. I would be scared to lose it even if had nothing in it. That bag is the stuff dreams are made of! LOVE it! Oh, that is an expensive bag but I think you get value for money when you use it often. It does look good on those OOTDs. The gold bar at the top is what caught my attention too. Amazing piece, gonna check this out. This is such a totally cute bag! I really love it but I don’t think I could bring myself to spend that kind of money on a bag… It is absolutely beautiful though! 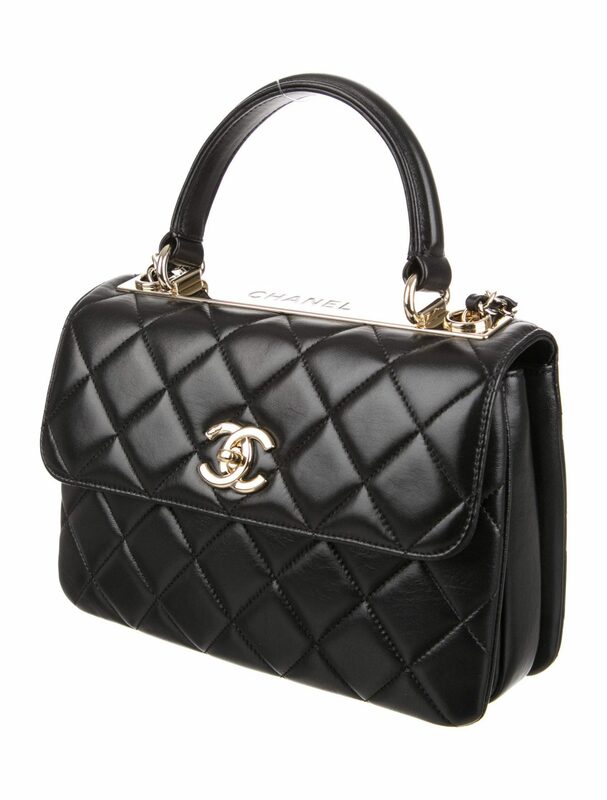 I love a great classic bag, and hopefully one day I’ll become the proud owner of a Chanel! It is such a beautiful bag! And the size of it is absolutely perfect to fit all the necesssities! This bag is absolutely a great investment! It’s so chic and you can play around your outfits with this classic. Lucky you! Thanks for the inspiration! What a great purse. You make me want to buy a Chanel now, but with two kiddos, I need a more durable purse. Great review! Lovely bag! Would you recommend conditioning and waterproofing a new bag? I definitely would! Here is a post I wrote about 2 steps to protect lamb skin and other exotic leathers! Hi Ophelia! Are you still looking for the woc with caviar and gold hardware? I visited a boutique a few weeks ago and was able to walk out with one. No wait list or anything! If you’re still interested, I went to the boutique at Short Hills mall. I know they have free delivery as well. That trendy woc is very luxe looking. It’s nice that it has more room! Thanks for letting me know!!! I think I called that one in the past and was wait listed there. Haha! Thanks for the heads up! ❤️Hope you’re enjoying your classic WOC! Please post additional pics styling this WOC with your outfits for all seasons. Hi. I’m just wondering where did you get this bag? Do you know if Chanel still sell this bag? Hello! I got this at a Chanel Boutique. They still carry these, but each season’s color offering is different. You can go check local boutiques and ask the sales. And they can check out what colors they have this season and what stores carry it. Hi! was wondering what color is the interior of the Trendy black WOC? Hello. It is black and red! How awesome is this?! I love it!